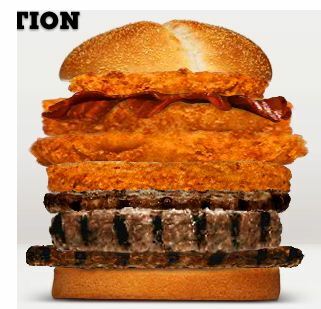 I’d like to draw your attention to Burger King’s website, specifically the menu and nutrition section. It allows you to design your meal, with any additions, subtractions, or replacements, and it then tells you the nutritional info. It’s part of their whole “Have it your way” ideology. It’s a nice service to have, especially if you’re counting calories. However, the biggest draw for me is the ridiculous amount of options and ways to combine them available on the site. You can put nearly everything on every sandwich, almost nothing is off-limits. I’ve listed a few of my favorites below (the names are my own, unfortunately there’s not option to name and save your creations). 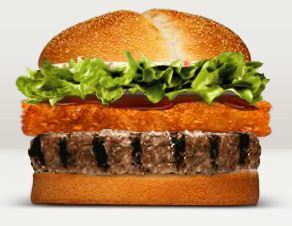 This is the Surf and Turf, a sandwich made up of a Steakhouse XT patty, a fish fillet, lettuce, and tartar and steak sauce. Next up we have the Mega Meat, in which I just threw on every meat option available. 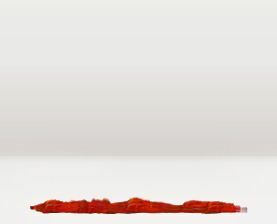 Finally, the creation I’m most proud of, The Puddle of Ketchup. Minimalism at its best. According to the site, it’s possible to print out the recipe you create and redeem it in person, but it warns that not every BK location is guaranteed to have every item. It also mentions that the price will vary based on the ingredients. I’d be interested to hear if anyone has ever tried this. Also, if anyone comes up with their own masterpieces, be sure to post the recipe in the comments section.